Zelda series producer Eiji Aonuma has given us an in depth look at the new Majora’s Mask 3D remake, providing over 15 minutes of gameplay. The showcase may be in Japanese, but the audio and visuals from the game are still relevant in terms of what we are going to see on the games’ release. We also now have subtitles, included in the video. Make the jump to check out the video! As you can see, the video gives us quite an in depth look at Clock Town, one of the central locations within Majora’s Mask. The 3D revamp looks really impressive for a handheld system, and I also have to commend the framerate of the game, as it looks very smooth! The video also showcases some of the new features exclusive to the remake, including the Owl save point statues and also the freely rotating camera (courtesy of either the c-stick functionality on the new 3DS systems or the circle pad pro functionality). 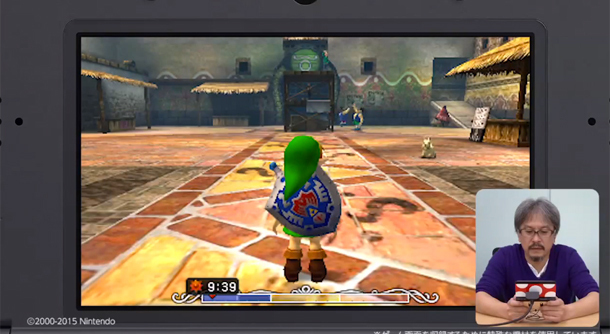 What are your opinions on how the new Majora’s Mask remake is shaping up? Can you spot any features other than the ones mentioned? Join the discussion below!